From the Gump's Holiday catalog a lovely wooden puzzle of illustrations from the First Edition of The Wizard of Oz . A great gift idea for the young one who loves all things Oz. Rekindle fond memories of the classic children’s tale while assembling illustrations from the 1899 first edition. 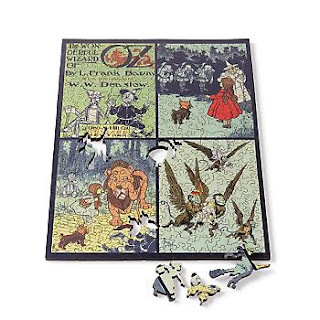 Crafted in maple-veneer plywood with archival paper and inks, the 245 pieces include numerous "whimsy" shapes, including Toto and the Tin Man.